Kyle inspects the welded ‘L’ shape kitchen canopy seams. Our long kitchen canopy and air extraction systems are designed for the larger kitchen environment. Whether it’s a pizza oven, chapatti oven, or deep fat fryer, our kitchen air extraction canopy units are designed to work as hard as your kitchen does. Each kitchen space is measured, CAD planned and fabricated to your exact kitchen specifications. Our supply of these kitchen canopy units is now national across the U.K and regional in South Yorkshire. Again, as with our smaller kitchen canopies, our kitchen canopy extraction units are constructed from locally supplied Sheffield stainless steel sheet. Each kitchen canopy unit is finished in a brushed/custom design and features our newly designed steel baffle filters. All kitchen canopy units utilise fully seamed filter housing and integrated grease traps. All kitchen canopy products are structurally reinforced and braced to prevent frame warping. All joints are professionally welded and polished as standard, preventing leaks, drips and actively promoting a safe and hygienic kitchen environment. Our final kitchen canopy products are wrapped in an easily removable poly-coating to prevent scuffs and marking during transit, this film is easily removed after the kitchen canopy is installed. Installing a kitchen canopy will actively ventilate your kitchen: removing grease and unpleasant odours, as well as making the statement that you are committed to a clean and safe working environment. Health and safety is always our main concern when developing and installing kitchen ventilation and as such, there are many factors to consider, such as: odour; grease; nuisance; noxious fumes and fire hazards. 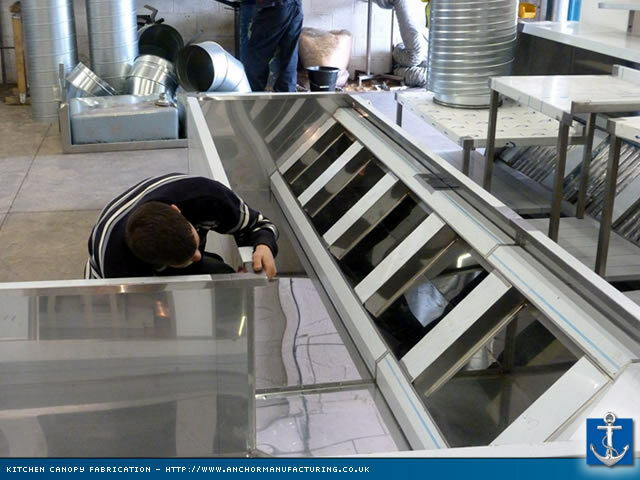 Anchor Manufacturing LTD have years of experience in the fabrication and installation of kitchen canopy systems: commonly providing solutions for restaurant kitchens, public house kitchens, hotel kitchens, the commercial kitchen industry, hospital kitchens and other health care kitchen establishments. Our installation team facilitate a fast and efficient kitchen installation service of the very highest standard. Long Kitchen Canopy with spine access. Kitchen Canopy with access spine inlet. An installed Anchor Manufacturing Kitchen Canopy. A small kitchen canopy unit.